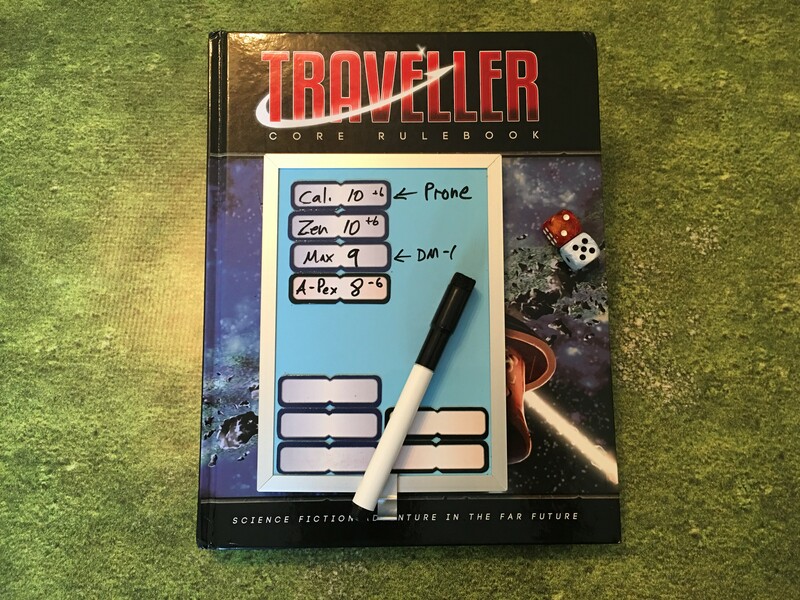 Here’s how I do initiative for Mongoose Traveller 2nd Edition. (Which is amazing by the way! Go buy it now!). There’s a cool initiative mechanic where a player can use Tactics to grant a +6 initiative bonus to allies (and -6 to enemies), but this applies to the first round only. So initiative changes after the first round of combat if someone is using Tactics. To make this super-easy, I took Paizo’s GameMastery Combatpad extra magnets (you can buy them here, although the style of the magnets have changed from what I have from a few years back). I use one color for allies, and a darker color for enemies. I place the magnets on a cheap magnetic marker board I got from Target. I mark down the player and enemies names on the left of the magnets. On the right side I put the natural initiative score and add the Tactics modifier (if there is any). After the first round I shuffle the magnets around. I alway have the players ranked in order of initiative for easy scanning. I also can put notes (like die modifiers or conditions) next to their names. You can also delegate this to another player to keep track of; one less thing for the GM to do!